1.1 It seems that Britain will have the first idea of how much a pair of Oculus Touch controller would cost. GAME store even offers pre-orders. It seems that Britain will have the first idea of how much a pair of Oculus Touch controller would cost. GAME store even offers pre-orders. The Oculus Touch has been long overdue. It is supposed to the Oculus Rift’s natural input controller instead of the Xbox One controllers Rift users now use to play virtual reality games for the headset. No official price or release date yet but there has been a light at the end of the tunnel. A tweet from Nick Summers, the associate editor for Engadget UK says that the Oculus Touch in going to be priced at around £190. Specifically, in Britain. Britain hosts a number of gaming stores but no specific location was mentioned in the tweet. However, it is suspiciously close to a GAME store in London’s Westfield Stratford City. GAME is a British based video game store much like GameStop is in the US. GAME is also an official retailer of Oculus products. The store not only confirmed that the pre-orders for the Oculus Touch is being taken today, but also revealed a winter release for the controllers. The release tip was made by an in-store Oculus representative. Anyone who wishes to pre-order a pair of Touch will have to deposit just £50. Virtual reality gaming on the Oculus Rift will finally have some cohesion like what HTC Vive offers its user base. 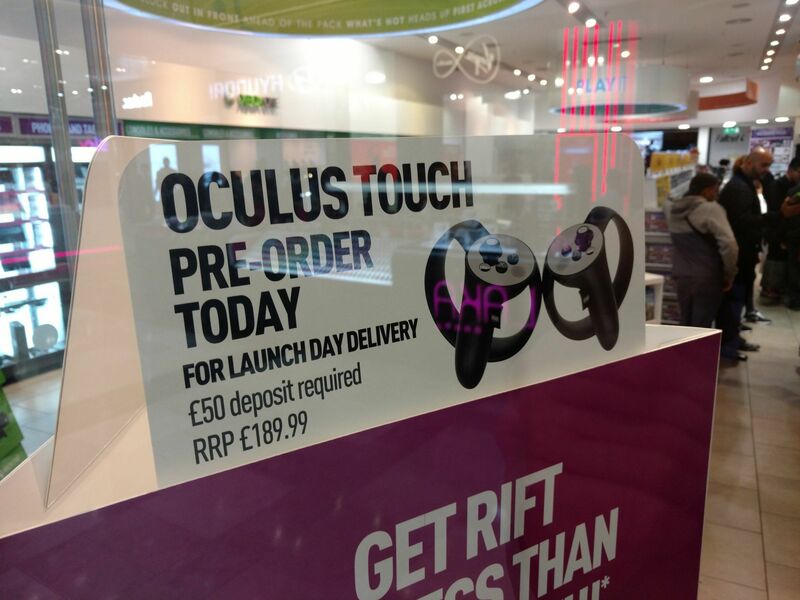 The advertising sign outside GAME store for the Oculus Touch pre-orders would have to be added at a later date. This is based upon the Oculus Rift headset release which was released multiple stores like John Lewis, Currys PC World and Harrods. This isn’t the first apparent price leak of Touch however. In the course of a week, two German electronic stores—MediaMarkt and Saturn—posted online listings of Touch, citing a €199 price with a November 21st delivery date. Price and shipping information has since been stripped from the online retailers’ respective listings. Online retailers are known for occasionally publishing placeholder prices, but a sign in a shop window taking pre-orders, even erroneously, nails the price of Touch down that much tighter. The only question that remains is: How much will the Oculus Touch cost for the US?